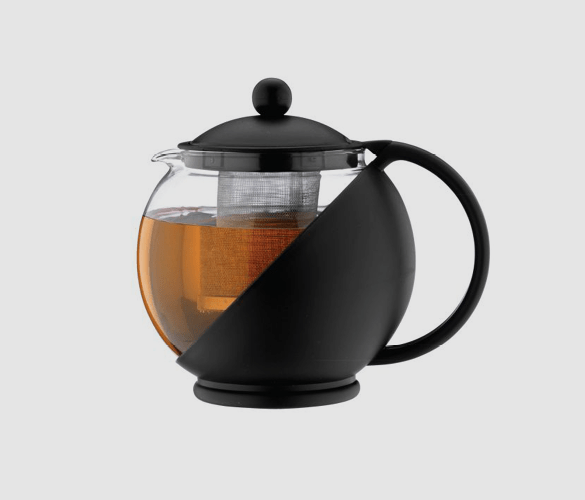 The Cafe Ole Everyday teapot is a convenient brewing device that delivers excellent results. The plastic material is a safe way to brew in the kitchen as there is no chance of broken glass or shattering. This product comes in a unique modern design that is simple yet stylish. The black asymmetrical feature is an effective design that would fit perfectly into any kitchen or dining room. The biggest benefit of using plastic for tea brewing is for safety. It is sometimes hard to avoid accidents in the kitchen as there are so many potential hazards, so using plastic where you can is an easy precaution to take. This is especially important for family households where children have access to the kitchen. When relaxing with a fresh pot of tea amongst friends it can become a huge inconvenience if glass is broken. A glass product will shatter all over the floor and cause a lot of mess. Plastic causes much less mess and is a lot safer for you and your guests. It is vital to keep your brewing accessories clean. Not only for hygiene and health reasons, but also to make sure you are getting the best flavour from your brew. A build up of past beverages or dirt will have a big impact on the taste of your beverage. To get the best results we recommend thoroughly cleaning this product after every use. It is also a good idea to clean a teapot as soon as you have used it rather than waiting to give it a clean. This is because the flavours can be absorbed by the material or plastic when left for long periods of time. To avoid this, make sure to wash with hot soapy water. If you want to remove a build up of product, try a little bicarbonate of soda to for a little extra cleaning power on the inside of the teapot. Brewing with loose leaf tea has many benefits such as greater concentration of antioxidants, fresher flavour, better aroma and a more refined taste. There are many ways to brew it, including using a teapot with an infuser built in. This method is super easy and delivers delicious results. Boil your kettle and allow the water to cool first for a couple of minutes. Allow to brew for 1 – 5 minutes depending on the type of tea. If it’s English breakfast, 2 – 3 minutes is ideal. If it’s a fruity blend, you may need a bit longer. To prevent over brewing, pour into a cup or remove the infuser (be careful, it will be hot).